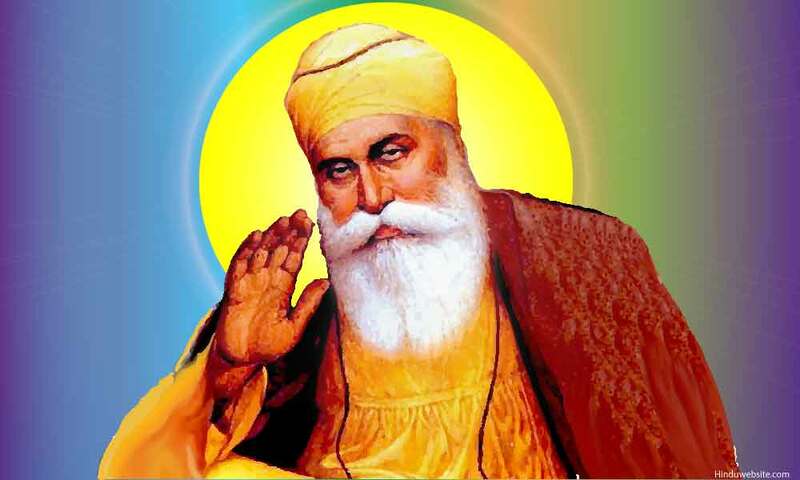 Guru Nanak is the founder of Sikhism and the first Guru of Sikhs. He is the last in the series of the greatest prophets born upon earth who were instrumental in establishing major world religions through their teachings and revelations. Guru Nanak led a simple but extraordinary life, preaching a straightforward way to find God in one's own heart through inner purity and social responsibility. He lived in troubled times, when religious practice in the Indian subcontinent was dogged by spiritual and moral crisis and the country was witnessing an intense conflict between Hindus and Muslims, aggravated by the religious zeal of Muslim rulers. It was also the time when Hinduism was undergoing an internal reform through the bhakti movement. Very few people in his life time would have thought that Guru Nanak's teachings would eventually culminate in the formation a new religion and attract millions of followers from various parts of the world. Guru Nanak Dev was born in 1469, in the village of Rau Bhoi di Talwandi, now called Nankana Sahib, forty miles from Lahore in present-day Pakistan. His father, Kalayan Das Mehta or Kalu Mehta, belonged to a sub caste of the Kshatriyas and worked as a tax collector. His mother was Matta Tripat. The Guru had an older sister called Bibi Nanki. From an early age Guru Nanak showed particular interest in spiritual matters. He became acquainted with the teachings of both Hinduism and Islam and met holy men of both religions. In the process, he developed distaste for the superficial aspects of religious practice, questioning their efficacy and value in achieving God realization. When his elders asked him to wear the sacred thread, usually worn by the upper caste Hindus, he refused, saying that he would instead wear the name of God in his heart as it would never be broken nor tainted with impurities. Guru Nanak's parents wanted him to lead a normal householder's life. So in 1487 they married him to a girl named Sulkhni, of Batala, through whom he had two sons, Sri Chand and Lakhmi Das. Like many other Prophets, Guru Nanak led an ordinary householder's life, signifying the fact that a true follower of God ought live in the middle of people and work for the salvation of himself and others through his good deeds and exemplary life. For some time he worked as a store keeper in the state granary of Daulat Khan Lodi in Sultanpur, where he came into contact with a Muslim servant named Mardana. The two were perhaps destined to meet, as Maradana subsequently began setting music for the hymns Nanak composed. Together they organized satsangs or religious gatherings, in which they involved both Hindus and Muslims in singing bhajans or devotional songs in praise of God. It is said that when he was twenty-eight years, he suddenly disappeared and returned after three days, revealing that he had a vision of God in which he was made aware of his mission in life. Declaring himself to be neither a Hindu nor a Muslim, He began preaching that there was only one God, who could be worshipped by any name and reached directly by any one, through abiding faith and devotion. He proclaimed God as the creator on whose command or Hukm moved all things and who being formless and transcendental would not assume any form, nor manifest Himself physically in our world as an embodied being. But, as the true witness, He resided in the heart of every one. So the best way to reach Him was by obtaining His grace through namsmaran or constant remembrance of His name and leading an ethical and selfless life. Guru Nanak criticized caste and gender inequalities, idol worship, superficial observances, sacrificial rituals, religious marks, widow burning, and many other practices which he believed were superstitious and not conducive to liberation. Among other things he acknowledged as valid were the law of karma, rebirth, respect for Guru, importance of righteous conduct etc. According to tradition Guru Nanak traveled widely in his life time and went as far as Assam in the east, Sri Lanka in the south, Tibet in the north and Mecca and Baghdad in the west. During his travels, he met people of all faiths: Hindus, Buddhists, Jains, Muslims, Zoroastrians. He also met Kabir, the famous bhakti saint of Benaras in whose company he spent some time, and who exemplified his vision of an ideal devotee of God with a pure heart and selfless attitude. In his life time Guru Nanak personified humility and simplicity. He always presented himself to others as an obedient follower of God who cherished His company and the sweet nectar of His love in his own heart. He never claimed himself any special privileges nor prophethood. His teachings stood in contrast with the religious practices of his time and in due course of time constituted the core teachings of Sikhism. He worked for the unity of people and universal brotherhood, by emphasizing the underlying unity of all men and the entire creation and the need for leading socially responsible and morally pure lives for the collective welfare of all. After traveling for twenty years, Guru Nanak decided to resume life as a householder. He acquired farmland on the banks of river Ravi in central Punjab and founded a town, Kartapur (the city of God). A small community of followers, mostly Hindus, gathered around him and began practicing the new creed he preached. Probably to preserve his teachings for future generations, he began composing hymns of great beauty in Gurumukhi, which became part of the Adi Granth (the original book), the holy book of Sikhs. At Kartarpur he introduced the practice of offering three daily prayers to God and also the institution of langar or community kitchen, where the followers shared food to signify the equality of all human beings. After institutionalizing the office of Guru and appointing Guru Angad as his successor Guru Nanak finally passed away at the age of 70. Nanakji taught that if God was to be found, he would be found in the inner chambers of human heart. If man is intoxicated enough with the name, memory and thought of God, he would experience Him in his own self. For Nanakji such a person was a true yogi and a true Brahmin, not the one who wore orange robes for appearance sake or some one who was born into a Brahmin caste. Nanak Dev castigated ostentatious display of religiosity and superficial observation of religious conduct. He laid emphasis on inner virtue and adherence to truth, sincerity and honesty in devotion to God. Without these man is devoid of any hope to earn the grace of God. According Guru Nanak God may be known to man by many names and attributes, but there is only one God. He is the creator (kartar) and sustainer of all, who abides in the realm of eternity, casting His graceful glance over His entire creation and who responds to the call of His true devotees, who are pure in their minds and hearts. In God's realm there are innumerable worlds and beings, who are showered by His grace when they submit to His Hukm (command). His supreme power is characterized by the twin principles of justice (nian) and grace (nadar). In the creation of God, human beings occupy the highest position. All human beings are created equal and endowed with the same potential to achieve mukati or liberation, which is freedom from the cycle of births and deaths and union with God. What prevents human beings from achieving it is their haumai or self-centeredness, which can be overcome by cultivating love (bhau) and fear (bhai) towards God, which is possible only through constant remembrance of the names of God (namsmaran), good works (kirat karana), charity (vaad chhakna) and overcoming the five vices, namely lust, greed, attachment, anger and pride. Guru Nanak traced the progress of the human beings on the path of liberation in five distant phases by attaining five distinct ideals: dharam, gian, saram, karam and sach. In the first phase man comes to know about God and his supremacy as the creator and upholder of divine justice (dharam). In the second he gains the knowledge (gian) and immensity of God's complex creation. This awareness creates in him the feelings of humility (saram) and self-surrender. This prompts him to overcome his self-centeredness and indulge in good actions (karam) such as constant remembrance of God's name, giving charity and doing selfless service. Doing good works, finally he becomes eligible for the divine grace through which he comes face to face with the divine Truth (sach) and attains liberation. The teachings of Guru Nanak are very relevant in the modern world, which is presently suffering from a deep moral and spiritual crisis, characterized by religious animosity, unbridled materialism, moral decline, superficial religiosity and misuse of religions and religious symbols. Even if you are not a Sikh, you can still apply his teachings to your daily life and benefit from them immensely, because his teachings transcend social and religious barriers and appeal to us directly as the guiding principles of an ideal human life that can bring out the best in our character and reconnect us with our source. If you ignore the subsequent developments that took place in Sikhism, where it developed its own religious formalities, symbols and code of conduct, you can be a Sikh without wearing the turban or the beard or the remaining Ks or without ever visiting a Gurudwara. Just as a Brahmin does not become a true follower of God by merely being born in the Brahmin caste or wearing religious marks, Guru Nanak would have declared that a Sikh would not become a true devotee of God and followers of his teachings by just being born in a Sikh family or wearing the five Ks or visiting a Gurudwara or by superficially reciting the Adi Granth. More important than all these is adhering to truth, devotion to God, constantly remembering His name, practicing inner purity by overcoming the five enemies of lust, greed, attachment, anger and pride, cultivating selflessness and doing selfless service to humanity. To realize God you do not have to renounce the world or become a monk. You do not have to wear orange robes or a beard or long hair, or subject your body and mind to severe austerities. You can lead a normal and ordinary life, as a householder, just as Nanakji did, doing whatever you are interested in, but with a selfless attitude, keeping your heart and mind filled with devotion to God and dedicating your life to the service of God and His creation. These are the values taught by Guru Nanak. They are still relevant today as they were centuries ago and can be of immense help, if we want to focus more on our inner connection with God rather than the Hukms and fatwahs (commands) of authoritarian institutions and mere superficial observances of each religion. Creative Being Personified. No Fear.